Join MORE THAN 60 MILLION PEOPLE who have already played this game and gave it an average rating of 4.81 (out of 5). 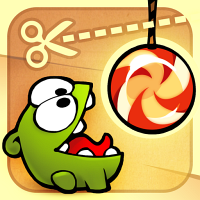 Originally, ZeptoLab's Cut the Rope game is the world’s first iOS game that won BAFTA Award! This browser version is powered by Internet Explorer and has nothing less than the iOS version. If you play the game on Internet Explorer 9+, you'll find much more levels. So it might be a good idea to start the game in IE 9+. GAME PATH: Gamers2Play.com - Angry Birds Games - Play Cut the Rope game!